Topology refers in a general sense to layout; similarly, a network topology defines the layout of the network. The three basic network topologies are bus, star, and ring. Following is a discussion of the different network topologies and their characteristics. A bus topology uses a main wire (or trunk) to connect all network devices so that they can communicate with one another. The main trunk is fairly cheap to install but expensive to maintain. The figure shows a diagram of a bus topology; notice that all systems are connected to a main cable. When a workstation sends data to another workstation in a bus topology, data (in the form of an electrical signal) is delivered across the full length of the trunk. Each workstation looks at all data that runs along the trunk. If the data is destined for a particular workstation, that workstation copies the data to the memory on its network adapter. 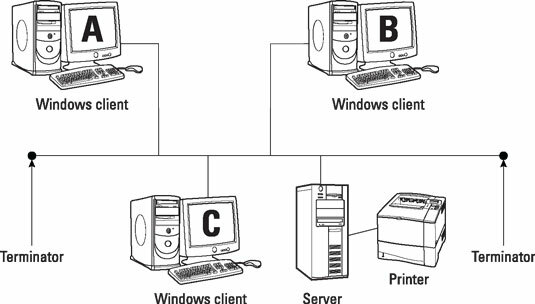 For example, the figure shows what happens when client A sends information to client B. The information runs along the trunk. When it passes by client C, client C checks whether it is also a destination for the information; if not, client C ignores the data. The information continues down the wire and makes its way to client B. Client B looks at the data to determine whether the data is destined for it; if so, client B copies the data and stores it in the memory on the network card. Note that because client B has made a copy of the data, the data is still on the wire. The data continues on the wire past the server and hits the terminator at the end of the trunk segment. 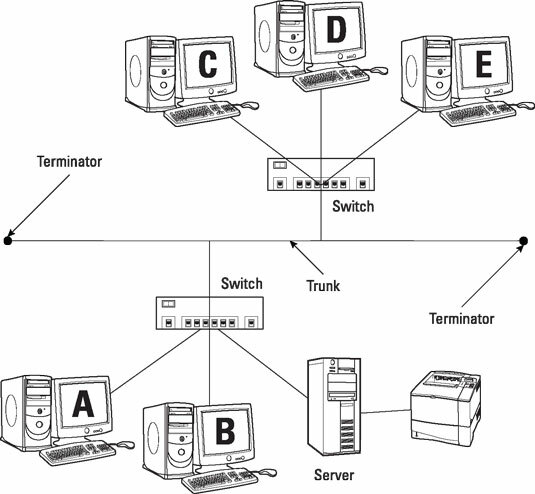 A terminator is a device that absorbs the electrical signal when it reaches the end of the network trunk. If there were no terminator at the end of the cable, the signal would bounce back in the other direction and collide with any new data being placed on the wire. So, to prevent this collision, the terminator grabs any signals that hit it and ensures that it is absorbed off the wire. In a bus topology, any break in the wire creates a nonterminated end. When there is a nonterminated end on the bus signal bounce occurs and as a result the entire network collapses. One of the most popular types of network topologies today is the star topology. A star topology, shown here, involves a central component, called a hub (older networks) or a switch (today’s networks), which connects all systems and is used to send the electrical signal to all connected systems. With the star topology shown, if client A sends information to client D, the information first travels from client A to the hub. The hub sends the information through each port on the hub: as a result, reaching each workstation connected to the hub. Each workstation is responsible for determining whether it is the data’s intended destination. When client D receives the data, it checks the destination address of the packet, identifies itself as the recipient of the data, and then copies the data to the network adapter’s memory. If the data is not destined for the client, the client simply discards the packet. 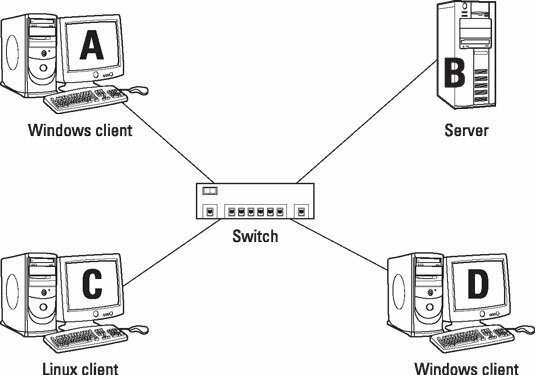 Today’s networks use switches instead of hubs. Here’s an example of how a switch works. When client A sends data to client D, the information first travels from client A to the switch and then the switch forwards the information only to the port that client D resides on. The information does not get sent to all the clients connected to the switch, like what a hub does. This data path offers performance benefits and also security benefits. One of the major benefits of using a star topology is that if a cable breaks, it doesn’t take down the entire network like it would with a bus topology; only the workstation connected to the broken cable is affected. If a hub device breaks, however, the entire network fails. In all fairness, though, the cost to implement a star topology might be a little more than a bus topology because of the price of the hub or switch device used. A mesh topology is a network topology that involves each system having a connection to every other system on the network. This is very costly because you need enough equipment such as network cables and network cards to connect all systems to one another. The benefit of a mesh topology is that you have multiple pathways to send data to any system on the network. This is a way to add fault tolerance to the communication system. A hybrid topology is a mixture of two or all of the three basic topologies. For example, you could use a bus topology as a main trunk, connect hubs to the main trunk, and then connect the systems to the hubs. This figure shows an example of this type of hybrid topology. To be more accurate, the configuration shown here could be called a star-bus topology — a star topology mixed with a bus topology. Today, the most popular topology in use is the star topology — or maybe even a hybrid topology using a star-bus layout. Today’s networks allow more mobility for network clients by supporting wireless technologies. To implement a wireless solution, you build a wireless network that uses a wireless topology. 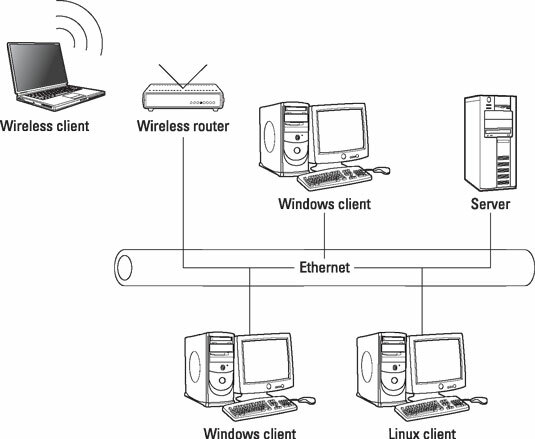 A wireless topology typically involves a wired network with wireless clients connecting to the wired network through a wireless access point (WAP), which is a device that sends and receives signals to a wireless client via radio waves (shown). Notice that the wireless client sends data to the WAP, which has a connection to the wired network. The WAP sends the wireless data to the destination system by sending the signal through the wired media.